Because recipes were made to be broken when you’re broke. 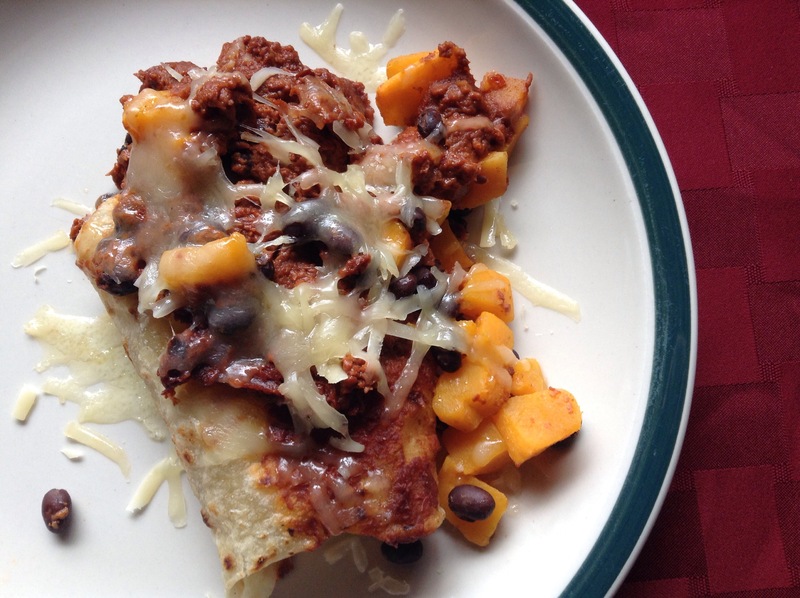 My inspiration and guidance for this recipe came from Feasting at Home’s recipe for Butternut Mole Enchiladas. To start off, I had one lonely butternut squash and a can of black beans, so in my mind I had the basics and I could wing the rest. a partial bag of ghiradelli dark chocolate chips that my daughter’s boyfriend gave to her for her birthday with strawberries. I took a handful that I thought about equaled 2 oz. Shhh. Don’t tell her. Enchiladas are not really enchiladas if you don’t have tortillas, so while the squash was roasting, I threw together 2 cups flour,3/4 c water,1/2 tsp salt, and 3 tbls oil in to a bowl. My youngest likes to do the kneading part (and he doesn’t even have to be reminded to wash his hands first anymore!). The dough doesn’t need to be kneading too well like yeast bread would. Just about a dozen tosses. After letting it sit for 10-15 minutes, kiddo divided it into 8 little balls. He was my “flattener” ,rolling the balls into something that looked tortilla shaped. I use a cast iron skillet to cook them in a little bit of oil. I’m probably terrible at explaining this but I bet if you go to youtube, someone has a video of how to make them. Ahhh…like this! Although they use lard in their recipe. And I don’t have a nice tortilla warmer like that. I never even knew I wanted one until right now. I followed the recipe for the Quick Mole Sauce substituting crushed tomatoes for tomato sauce, garlic powder for cloves (1/8 tsp for every clove), and the seasoning mix & spices in lieu of chipotle chilis. I used peanut butter instead of tahini which I thought was going to be super weird but it turned out awesome. I omitted the soy sauce entirely because my soy-sauce-hater daughter was looking over my shoulder and I knew I wouldnt get away with even a dribble of it in there. A delicious mess on a plate. For those who don’t know their squash varieties, this is butternut. One of my kids isn’t a fan of squash but she’ll eat (and like) butternut if it’s in something. It’s versatile and has a pumpkin-ish taste…but different. Sweeter. Previous Previous post: Daily Dozen: Links galore.Well, 12 to be exact. Don’t Post- I really Identify with Poor as Folk, like your writing style and philosophy. I’ll be in a place like yours when I retire but right now I would like to donate, however, I don’t want to provide all the information that Patreon asks for. Is there some other way that I can help?